The Advanced Fall Protection Training prepares students to be ready to perform advanced rescue techniques and deal with complexed tower climbing systems. Basic tower rescues can be straight-forward, assuming that an injured co-worker must be lowered straight down to the ground with use of the traditional self-rescue, or two-person rescue through use of a pick-off style rescue. However, many rescues call for advanced techniques with raising systems, cross hauls, and different types of ground based and tower based rescues. Our advanced class was developed with these scenarios in mind. These valuable skills carry into a technician’s workday for many uses including day to day rigging practices. 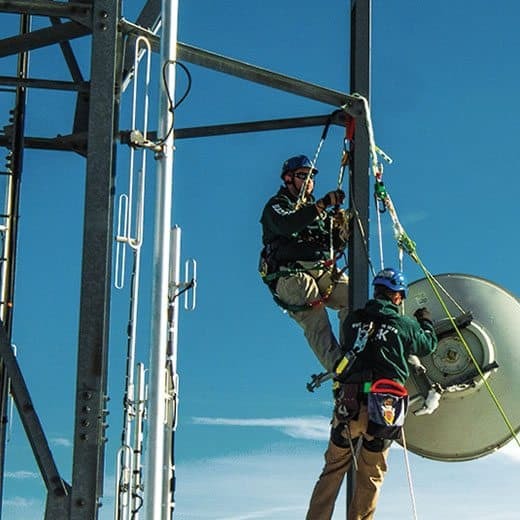 This course is designed to train tower climbers and tower owners in the theory and application of advanced tower rescue techniques, planning, and responses. OSHA states that workers must be able to promptly perform rescues of themselves and each other while working on towers and similar elevated structures. This course meets the requirements of OSHA Regulation. SPRAT (Society of Professional Rope Access Technicians). The afternoon training will put theories learned in the classroom into specific application on the tower. Students will demonstrate skills learned through scenario-based training missions which are delegated and supervised by the Instructor. Various rescue scenarios will be given. Students will demonstrate skills learned in the classroom to set up various raising systems used in different types of scenarios. Skills obtained will be real-world applications as they apply to tower workers. Students will have the ability to perform ground-based and tower-based rescues and lifts, depending on the available crews and equipment at their particular worksite. Students will also have the ability to learn cross-haul scenarios as it applies to tower work. Student requests for specific applications or difficult challenges are welcomed and encouraged. Students will receive the Safety One Advanced Fall Protection Safety and Rescue Student Manual and other materials necessary for the course. Our Rigging Training courses are designed for workers using mechanical systems to hoist loads on various structures for work purposes. Providing technical knowledge, skills, tools, and support that students need to be an effective fall protection trainer. For companies that have five or more employees that need safety certification, Safety One offers all open enrollment courses and customized fall protection trainings at the client’s site. By tailoring a training course to your site and your staff, we are able to address specific issues unique to your business needs and resolve fall protection hazards in and around your facility. In addition, there is cost savings by reducing employee down time.